The American Booksellers Association will once again be awarding the Avin Mark Domnitz Scholarship to attend the upcoming ABA Winter Institute (Wi9) to the owner or an employee of a bookstore who submits the store’s 2012 financial data to the ABACUS-12 survey before the July 15 deadline. The American Booksellers Association announced this week the opening of registration for the two upcoming IndieCommerce Institutes (ICI). Booksellers with IndieCommerce stores are urged to keep an eye on their inboxes for an e-mail notification –– including a link to the registration page –– to arrive when the ICI registration site goes live tomorrow, at 1:00 p.m. (Eastern). In its third year, American Express’ Small Business Saturday has established itself as the preeminent national holiday promotion for Main Street businesses, and it is generating substantial national and local advertising that encourages consumers to support their locally owned businesses. This year’s roster of Oscar nominees is rich with book connections, from Life of Pi, to Team of Rivals, to Silver Linings Playbook, to Anna Karenina, to Frankenweenie. Given that, what better place to discover who will be this year’s winners than with your industry colleagues at Wi8? On Monday, July 23, the Department of Justice posted the 868 public comments received during the comment period for the proposed consent decree with three of the five publishers involved in its civil suit regarding the agency model. Also posted on the DOJ website was the government’s response to the public comments. On July 31, the American Booksellers Association and Barnes & Noble filed a motion petitioning the U.S. District Court for the Southern District of New York to allow them to submit an amicus brief in regard to the Department of Justice's' (DOJ) proposed consent decree affecting publishers' pricing of e-books and the agency model. 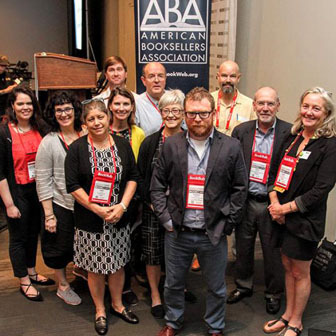 From July 20 - 22, the ABA Board of Directors met in Naperville, Illinois, to consider a range of issues of concern to independent booksellers. The American Booksellers Association announced this week the opening of registration for the second IndieCommerce Institute (ICI). The program will take place on Thursday, September 13, 2012, with a reception on the evening of Wednesday, September 12, and opportunities for hour-long one-on-one sessions with IndieCommerce staff on Wednesday afternoon and Friday morning, September 14. An upcoming intensive workshop facilitated by Paz & Associates offers an opportunity to gain a deeper understanding of essential aspects of independent bookselling and to establish a tangible competitive advantage.